Alex Simmons is a busy man. Not only is he writing five titles for Archie Comics, including Archie, Archie & Friends, Betty & Veronica, Jughead, and Veronica–and launching the “New Kids off the Wall,” a big new story arc that will introduce a new gang of characters into the Archie universe–but Simmons is also the founder of Kids Comic Con, a yearly event at Bronx Community College focused on developing kids’ imaginations, which also travels to various cons throughout the year. When we spoke, he was about to embark on a week-long trip to Senegal, Africa, where he is presenting a version of his Kids Comic Con and showcasing his “Color of Comics” exhibit, which celebrates all of the different cultural influences in comics. He has since returned with pictures and video of this incredible event–see below! This, of course, makes him a perfect interview subject for Kids Comics Month. 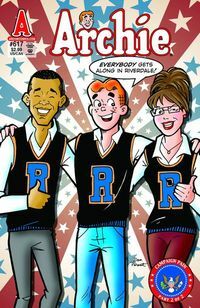 Read on to learn about the genesis of Kids Comic Con, how he’s making Archie less “whitebread,” and what his plans are for . . . Ethel? TFAW.com: You’ve got your fingers in a lot of different projects. You write, you organize conventions, you do voiceover work, you do a lot of different things. How do you juggle it all? Alex Simmons: I don’t sleep. I squeeze a family in there, too! I would have to say it started in my youth. I started out with a great love of drawing and writing. I wanted to become an illustrator, but by the time I graduated high school, I was interested in performing. So I sort of combined the three and did theater and extra work in films. I was doing Off-Off-Off Broadway shows, and when you do that you design your own flyers, and your own promotions and stuff. And I was also teaching and doing a lot of theater workshops and working with kids. And so a lot of that became part of my makeup. I always had a love of comics. So eventually writing theater led to me writing a couple of screenplays that didn’t go anywhere, which led to writing some comic book concepts, which led to getting published here and there, which, a few years later, led to properties like Blackjack and Race Against Time, and doing some stuff for DC and Archie. Over the years, my interest built and my experience grew, and some things I’d do and leave and come back to, and some things I would continue to do alongside of other things. TFAW.com: You seem to be quite an activist for kids comics. As a comics lover myself I can see why this is important, but what do you tell people who have never picked up comics and have kids? AS: It’s funny because I guess by virtue of what I do, I’m an advocate for comics, but really I think of myself more as an advocate of the creative arts and kids’ imagination, and validating that imagination. And comics are one of the ways that stimulate the imagination. When I talk to people who are unbelievers, I talk about the average child and that formula that has existed through time: a child sees something that stimulates wonder and curiosity, they imagine possibilities, and they pretend. And in those moments of pretending and wondering, they sometimes set their goals for the future: “I want to grow up to be a doctor or adventurer,” or whatever it is.